Edited by Tokoya, 29 May 2018 - 06:13 PM. Yeah, I'm not sure if this is set in the FT world or not either. We heard that FT was getting a sequel or something and that Mashima was making a new series too, but I sort of feel that maybe the FT sequel is going to be a small extra epilogue that Mahsima was going to do and this new series is going to be something completely original. That is kind of the feeling I get. It is tough to tell by character designs if they are actually related to FT characters because Mashima does like referencing his old characters in his new works. That being said I'll give it a try as I'm a big fan of his art and hopefully with a new work he doesn't get too lazy with the storytelling too fast. Still, the character designs look interesting as well. LOL, this isn't the sequel is it? Cuz these characters look EXACTLY the same as FT, smh. I was ok with the Gray/Musica and Sieghart/Mystogan/Jellal similarities between FT and Rave. But to have another series with carbon copies of characters? Silver/white hair guy looks cool tho. Edited by Fenrix, 29 May 2018 - 07:18 PM. He probably has had the 50 versions of each character since a child. Only thing that could explain this. He seems lazy now. I think Rave was his best work. At least Kubo had the same face problem in one manga. Lazy is not the word I would use. 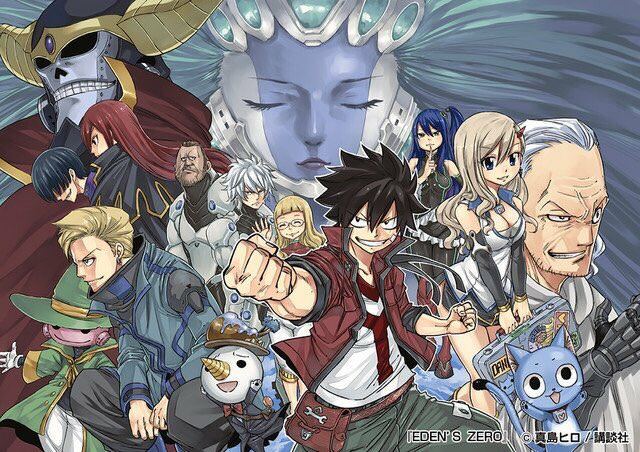 Mashima has managed to released seven chapters in one month, he never takes breaks, etc. On the other hand, I admit he's obviously running out of imagination in terms of character designs. You guys never heard of Star system? Tezuka used it. Kurumada (Saint Seiya's mangaka) uses it. Basically they reuse the same character designs over and over again in different manga, but of course in different roles. Yeah I'm not sure if I would call this "lazy" either considering his work ethic. I'm guessing it may be the magazine who wanted him to make something similar to FT since these big companies only seemingly want to use the same ideas all the time. Tbh, at first I thought this was just a promo where Mashima used his old characters to introduce the new ones. Now I'm not sure anymore I wouldn't be surprised if he just used the same designs though, these have proven to be effective after all. I have 0 interest in this series. I don't really get the complains about reusing designs. I mean he did that from Rave to FT too. Most artists do that from series to series as they aren't going to change their style with drawing characters. I don't know, it doesn't bother me. I guess I've read a lot of American comics where artists basically draw all their characters the same from series to series so I'm used to it. And I think when people call Mashima "lazy" they are referring to his storytelling, or at least I was. His problem is that he falls back on the same old formula with his arcs and it really drains the life out of the arcs I think. He can set up interesting arcs, but then it always feels like it ends the same way and it can become a chore to read over and over. Whelp. Guess we now know NaLu and Gruvia didn't happen. That boy is clearly a product of....Natsay?....Gratsu?.....Nagray? I'd go with either Nagra or GraNa. Lazy? Heh, compared to the crap other mangaka's have been pulling lately (Exact Same Cliched Sh*t, Different Day), Mashima is frickin' Shakespeare. Lucy, Wendy, and Erza weren't not stereotypes and Gray and Natsu were a whole lot more entertaining/bearable then many other male leads. Yeah Hiro is a hard worker when it comes to amount of stuff he can produce and it's great about him, but when it comes to content, the story, he really can't keep his concentration even if he comes up with something great like there were many opportunities in FT to make great story, which he did cut short. But then he doesn't need to try that hard exactly because of the mentioned "Exact Same Cliched Sh*t, Different Day" that we all can see in other mass produced, derived of any ambition manga production, with boring moe sh*t and gay male characters with their forced harems (ok there are some productions that have more to them but however..), where Natsu was already "brilliant" character, as he was simply asexual and that made him to stand out lol, also the forced fanservice that was either out of context or purely comical was more enjoyable than in many other productions where the series would put them so that anyone would read it. W/e. And the main character is no natsu or gray. It's ACNOLOGIA! I'm sad I wasn't invited here earlier. I'll go read stuff the now. And oh I so know I'll be reading it (after 15 pages it's already better than boruto).